K1 Race Gear was born in 2003 with the philosophy of offering products to our customers that we ourselves would be proud to use. At K1 Race Gear, we are racers ourselves, and we understand the value of buying quality racing products at a reasonable price. If you are involved in motorsport, we highly recommend K1 RaceGear Nomex underwear base layers that can provide invaluable protection in critical times of fire danger and help you escape potential injury. The K1 RaceGear GK2 karting suit is a great entry-level suit with features that are normally found on much more expensive suits. The knit cuffs and lower and crotch stretch panels aid in comfort. Description: SFI 3.2A/5 Certified (SFI 5) Select from 16 designs and endless color combinations to create the prefect fitting custom suit. Suits are made to order and Typically take 4 weeks from Final approval of proof. K1 RaceGear was born in 2003 with the philosophy of offering products to our customers that we ourselves would be proud to use. At K1 RaceGear, we are racers ourselves, and we understand the value of buying quality racing products at a reasonable price. To meet the needs of our customers, we strive to provide quality racing equipment at K1 RaceGear - including racing shoes, suits, driving gloves, and more - to racers of all ages at a great value. Whether your son or daughter is just starting out in the sport or you have a life-long passion for racing, we have the products for you in our full line of K1 RaceGear. 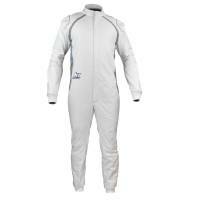 Racing Shoes, Racing Suits, Driving Gloves, Helmets, Children's Products and More! We offer a variety of racing products at K1 RaceGear, including karting and auto racing equipment. Our auto racing product line features products constructed of SFI Manufacturer Certified materials, most of which are built with double layer DuPont Nomex III to provide maximum safety and protection. If you are looking for fire-rated racing equipment, including suits, shoes, driving gloves, or under garments, K1 RaceGear should be your first choice. We are dedicated to helping racers secure the equipment they need at reasonable prices and we will work with you to ensure you have the gear that you need. Our karting product line, perfect for indoor or outdoor karting enthusiasts, is designed to meet all of your karting gear needs under one ""roof"", so to speak! For professional racers, we offer Level 1 and Level 2 karting suits that meet all CIK and FIA requirements for competition use, as well as rain suits and boots for outdoor events. We also offer entry level racing equipment at K1 RaceGear, including racing suits, shoes, driving gloves, chest protectors, rib vests, CoolMax® fabric under garments, accessories, and bags. Everything you will need at the track can be found at K1 RaceGear!"